With the shocking news earlier today of the death of Don Cornelius, the former Chicago radio / TV personality and creator / host of the iconic "Soul Train" television show, Weigel Broadcasting's WCIU-TV will pay tribute to the legend tomorrow morning, and then again for many hours this weekend. WCIU-TV, the first television station Don Cornelius ever worked for and where "Soul Train" was created, will do this first on their weekday morning program "You & Me This Morning," and then later by simulcasting a seven-hour marathon from Bounce-TV on Saturday night. Beginning at 6:00 am tomorrow (Thursday) morning, WCIU-TV's "You & Me This Morning" will be be spending much of the two-hour show celebrating the life of Don Cornelius. Hosts Jeanne Sparrow and Melissa Forman take a look back at the start of Don Cornelius' television career on WCIU-TV in the late 1960s, and his rise to national fame in the 1970s and beyond. Bounce TV, the first-ever national over-the-air broadcast television network specifically targeting African-Americans, which is seen in Chicago on Weigel Broadcasting-owned WWME 23.2, will be airing a seven-hour long marathon of "Soul Train" episodes Saturday evening, beginning at 6:00 pm. WCIU-TV will be stopping all of its pre-planned programming for that evening to instead simulcast the Bounce TV broadcast of the "Soul Train" marathon. The special presentation will be hosted by TLC's Rozonda "Chilli" Thomas. The marathon will begin with "Soul Train's" first-ever nationally syndicated episode and conclude with Don Cornelius' final episode as host.The Bounce TV salute to Don Cornelius and "Soul Train" will be able to be seen over the air on WWME 23.2, as well as the stronger HD signal on WCIU 26.1. For those with cable / satellite systems, WCIU-TV, aka "The U," can also be seen locally on Comcast / Xfinity HD 183, RCN 6, RCN HD 606, WOW 6, WOW HD 207, AT&T U-verse 10, AT&T U-verse HD 1010, DirecTV HD 26, and Dish Network 26. WVAZ-FM / V103 and Herb Kent will have a special presentation on the air this Sunday, calling it "Don Cornelius Day." During Herb Kent's regular Sunday shift of Noon - 7:00 pm, instead of just playing old favorite music, the show will be focused on an old favorite legendary talent: the late Don Cornelius. For seven hours, the station will be celebrating the life and legacy of legendary, trailblazing broadcaster. While Sunday afternoon's show will be a celebration, the reason behind this celebration is a sad one. Yesterday morning, the country was shaken by the shocking news of the death of Don Cornelius, the former Chicago radio / TV personality and creator / producer / host of the iconic "Soul Train" television show. Cornelius, a native of Chicago's Bronzeville neighborhood, and who started his incredible media career and "Soul Train" show here locally, was only 75 at the time of his death. Throughout Herb Kent's seven hour show, very special guests will join him in talking about the greatness of Chicago's Don Cornelius. Among those scheduled to participate are former WBEE-AM / WCIU-TV / WGN-TV legend Merri Dee, former WVON-AM great Bill "Butterball" Crane, WBEZ-FM's Richard Steele, singer / Cook County Commissioner Jerry "The Iceman" Butler, and singer Gene "The Duke Of Earl" Chandler. Of course, Herb Kent, a radio legend himself, former co-worker of Cornelius' at WVON-AM, and life long friend of his, will be sharing his many memories throughout the day. Additionally, fans will be welcomed to call into the WVAZ-FM studios on Sunday afternoon to share their reflections of Don Cornelius. Derrick Brown, Clear Channel Chicago's Director of Urban Programming, said in a statement late today: "Don Cornelius was a true visionary. He took "Soul Train," a local concept and made it a worldwide phenomenon. He deserves our gratitude and respect." Herb Kent pointed out: "Without Don Cornelius and the "Soul Train" show, music wouldn't be what it is today. He gave R&B music a giant boost." The Sunday afternoon radio salute will be able to be heard over the air on 102.7 FM in Chicago, as well as worldwide via the V103 website and Clear Channel's iHeartRadio app. According to numerous reports, Don Cornelius, the former Chicago radio personality and creator / host of the iconic "Soul Train" television show, has died. Reports claim that Cornelius was found in his at his Mulholland Drive home in Los Angeles at approximately 4:00 am (PST), dead from an apparent self-inflicted gunshot wound to his own head, in what looks to be a suicide. He was officially pronounced dead at 4:56 am at Cedars-Sinai Medical Center. Authorities are investigating deeper. Don Cornelius was a part-time DJ and news anchor for Chicago's WVON-AM in the mid-1960's (starting in 1966). He had also been hired to use his cool, deep voice to do some station announcing and sports anchoring for WCIU-TV. As many DJs did in the 60's to make extra cash, Cornelius emceed concerts, "record hops," and high-school dances around the Chicago area, calling these events "The Soul Train." WCIU-TV and Cornelius thought it would be fun to bring these types of live events to television. They sought to combine the excitement of the Cornelius-hosted live events with the format of TV's "American Bandstand." Cornelius shot and produced the pilot for the show on his own, using $400 of his own money. WCIU-TV loved the pilot and signed it up right away. The locally produced, locally-only shown daily dance show called "Soul Train" began airing on WCIU-TV in August 1970. The initially very low-budget show was shot & aired live in the later afternoons, right after Chicago schools let out, to help draw in the younger viewers. It was an almost instant hit in Chicago. Just over one year later, in October 1971, the show was moved to Los Angeles and became a nationally syndicated weekly smash, eventually being seen in almost 100 markets. More than that, the program, in its prime, was a cultural phenomenon and historically important program. Not only did "Soul Train" help to launch or springboard up the careers of numerous artists, the show simplistically helped break down racial barriers that still existed in the 1970's. Black artists, music, fashion, dance styles, culture -- even Black commercials -- that were not previously widely seen by White, middle-class America, were being shown to the masses, and being openly accepted and appreciated in homes nationwide, thanks to popularity of "Soul Train." The show's creator and producer, Don Cornelius, hosted the program from its start until 1993. The show itself lasted until 2006, with various other hosts, but none had the magic touch or cool charisma of Cornelius. The show currently holds the distinction the longest-running, nationally syndicated program in television history. (At least for a few more years, until "Entertainment Tonight" and/or "Wheel of Fortune" will surpass it). The City of Chicago honored Cornelius and "Soul Train" last summer with the first-ever "Soul Train" Photo Exhibition at a Chicago gallery (which also featured "Soul Train" dances on weekend nights), by announcing the honorary naming of a street after him, and with a giant "Soul Train 40th Anniversary Concert" on Labor Day at Millennium Park's Jay Pritzker Pavilion, with Don Cornelius himself at the show. Cornelius was said to have been in ill health and suffering from various ailments in recent years. He went through a ugly divorce in 2009, ending a bitter marriage that had very public fights and incidents. Despite how his life may have ended, it is how he lived his life, the paths he blazed, and all the countless of hours of incredible music & entertainment that he gave to a worldwide audience, which will be remembered forever. As the man himself would say as he ended his weekly "Soul Train" program: "...And you can bet your last money, it's all gonna be a stone gas, honey. I'm Don Cornelius, and as always in parting, we wish you love, peace and soul!" 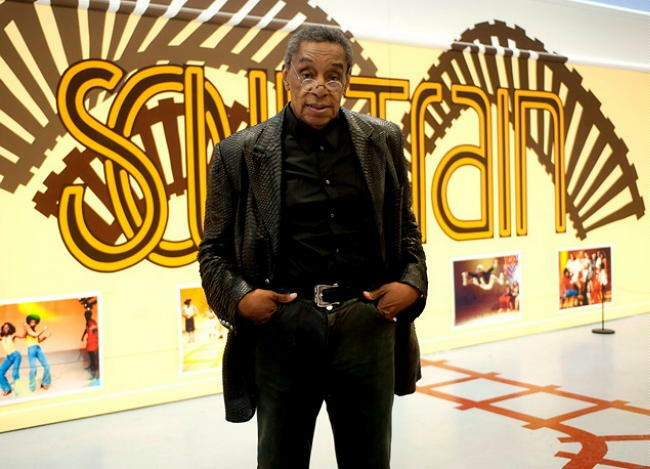 Fans, friends and colleagues of Don Cornelius will pay tribute to the legendary creator, producer and host of Soul Train at a public memorial service Wednesday at the Museum of Broadcast Communications, 360 North State Street. Doors will open at 5:15 pm, and the event will be broadcast live from 6 to 8pm on WVON-AM (1690), the Midway Broadcasting news / talk station. Cornelius, a native of Chicago’s Bronzeville neighborhood, began his career in radio on the Chess Brothers’ original WVON before joining Weigel Broadcasting’s WCIU-Channel 26, where he launched Soul Train in 1970. He died at 75 of a self-inflicted gunshot wound earlier this week at his Los Angeles home. Speakers at the service are expected to include the Rev. Jesse Jackson, soul singer and Cook County Commissioner Jerry The Iceman Butler, Radio Hall of Famer Herb Kent, radio executives Marv Dyson and Melody Spann Cooper, producer Don Jackson, and colleagues Richard Steele and Jeanne Sparrow, among others. Billed as a celebration of the life and career of Cornelius “and the Soul Train generation he inspired,” the service is being presented by WVON, WCIU/The U, and Clear Channel urban adult-contemporary WVAZ-FM (102.7). In a related event, V103 has designated Sunday Don Cornelius Day, with Kent hosting a special edition of his show from noon to 7pm. Celebrity guests and listeners will reflect on the legacy of the Chicago visionary and legend. Because of plans for the Cornelius memorial, the Museum of Broadcast Communications has postponed A Salute to Radio Hall of Famer Herb Kent, which had been scheduled for February 11. Berry Gordy, Jr. might have introduced MOTOWN as the “SOUND of YOUNG AMERICA”, but it was Don Cornelius who brought the “SOUL of ALL AMERICA” into our living room for 35 years. His syndicated TV show, SOUL TRAIN was the safest place to see the latest fashions, the newest dance steps, and for a long time the only place to see African-American performers on a regular basis. Thanx for your clever turn of phrase in your announcement of Don Cornelius demise ... it was so precisely stated as to draw tears ... "... bought his own ticket on the Soul Train to the great beyond ..." Yeah ... exactly. Sad. 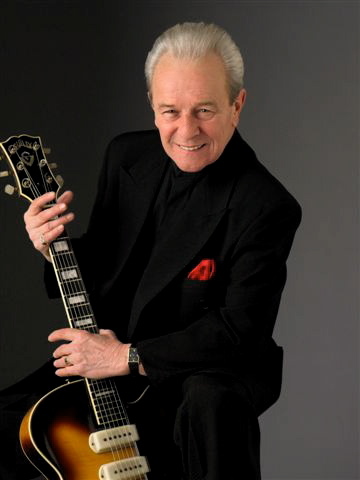 RIP, Don! It's been a few years since we saluted the date forever immortalized as "The Day The Music Died" ... and, quite honestly, I wasn't sure I'd do much to spotlight it today either. In a way, it almost seemed to be overkill ... 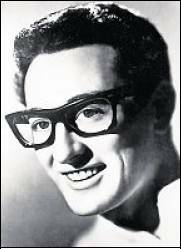 I'm sure radio stations across the country will be playing the music of Buddy Holly, Richie Valens and The Big Bopper all day long today ... along with (unfortunately!) repeated plays of "American Pie", too ... so I figured most of you would have already had your fill without me adding to the deluge! But a few of our readers sent in memorial pieces or articles ... and I didn't want to slight anybody ... so I've run a few of these new pieces along with a link to our 50th Anniversary Forgotten Hits coverage from a few years back, too. With the anniversary date of February 3 coming up, and you probably have done this in the past, why not see how many tribute records your readers can come up with concerning the three artists who passed away. Interestingly enough, we got THIS audio tribute from another FH reader ... spotlighting a couple of the tributes you're most likely speaking of! I've been enjoying Forgotten Hits for a few years now; thanks for your good work. I think I might have already sent this, but since we're approaching the anniversary, and since mentions have been made to "American Pie," I thought you might like to share this little piece of work that I did - well, 40 years ago (and then digitally remixed it a few years back). And check out this picture of Dion, after Winter Dance Party Tour. 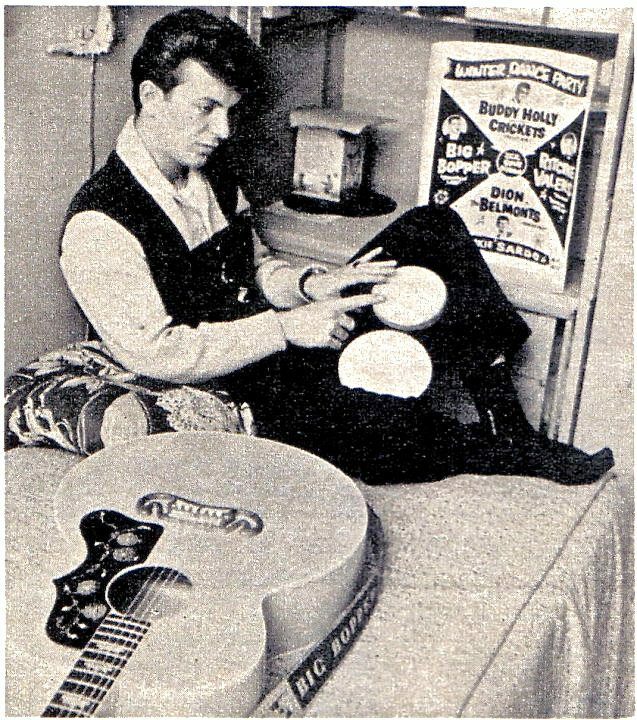 Check the guitar strap ... it says Big Bopper. Fans gather every February to honor three ’50s rockers killed in their prime and to remember the music that lives on. CLEAR LAKE, Iowa -- At 1 a.m. Friday, a handful of people will gather under a waxing moon on a gravel road about 5 miles north of here. 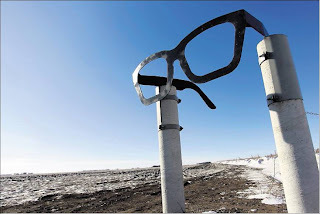 As they listen to Don McLean lament “the day the music died” in his 1971 song American Pie, they’ll walk, as they do every year, to the site of the plane crash where singers Buddy Holly, Ritchie Valens and The Big Bopper died a few minutes after 1 a.m. on Feb. 3, 1959. “We give thanks for the lives of these people that brought us all together and thanks for the music,” says Paul King, 66, a retired businessman from Northampton, England. 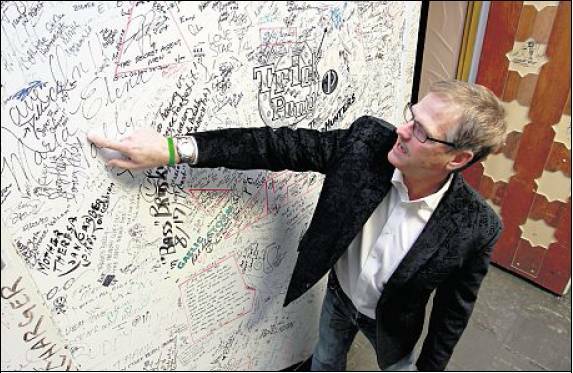 He is a member of the British Buddy Holly Society and has made 24 pilgrimages to Clear Lake. The after-midnight procession is the culmination of an annual celebration of the three young rock ’n’ roll singers and the Surf Ballroom, the venue in this town of 7,777 where they performed their final show. The Surf, built in 1948 — after its first incarnation across the street on the shores of Clear Lake burned down a year earlier — is a shrine to the 1950s. It has its original ticket window, wooden dance floor and booths and a meticulously restored seashore-and-palm-trees motif. Faux clouds still roll across the black ceiling. The ballroom will be packed this week during the annual four-day commemoration of the Winter Dance Party that brought the three young stars to town 53 years ago. It has been designated a historic landmark by the Rock and Roll Hall of Fame and is listed in the National Register of Historic Places. The original ballroom, built in 1934, hosted all the famous acts of an earlier era: the Glenn Miller Orchestra, Count Basie, Lawrence Welk. By 1959, the new Surf was rocking. Karen Spratt, 69, grew up on a farm near Clear Lake. “We milked cows twice a day and had a radio in the barn,” she says. “We learned all the words and sang along. My idols were Buddy and James Dean.” She was barely 16 when the Winter Dance Party came to the Surf, but her mom said she could go. Admission was $1.25. 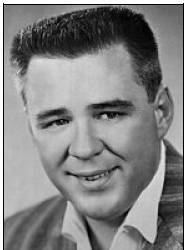 Holly, the headliner, Valens and The Big Bopper had been touring the Midwest by bus with Dion and the Belmonts and Frankie Sardo. Holly was not accompanied by the Crickets, his original backup band. Waylon Jennings and Tommy Allsup shared the stage with him. Holly’s hits Peggy Sue and Rave On were radio staples. 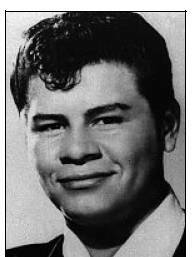 Valens’ La Bamba was a Top 40 hit in 1958 and the Bopper’s Chantilly Lace was released that summer. In his 2011 book Dion: The Wanderer Talks Truth, Dion Dimucci described what happened. Holly, he wrote, decided to charter a plane to fly to Moorhead, Minn., for the next stop on the tour. The small plane had room for the pilot, Roger Peterson, and three more. In the dressing room, Dimucci wrote, a coin was flipped to see who would fly with Holly and who would ride the bus. DiMucci and The Big Bopper won, but DiMucci opted out after he was told the flight would cost $36 each. “I said to Ritchie, ‘You go,’ ” he wrote. The plane crashed minutes after takeoff; all four men were killed. Light snow was falling as the plane took off. Investigators concluded the crash was caused by poor weather conditions and pilot error. Bill Wobbeking was at the Surf that night. He had just turned 18 and was attending college in nearby Mason City. After the show, he and a friend talked about Holly’s performance. “We kept saying over and over, he’s better than Elvis,” says Wobbeking, 71, who lives in Urbandale, Iowa. He says the Surf is a joyful place. “My last memory of being in there that night was a happy time,” he says. But Wobbeking can’t bring himself to visit the crash site. Bob Hale, who was a radio DJ here in 1959 and emceed the Winter Dance Party, has tried to walk into the field to the crash memorial, but he had to turn back. At the Surf that night, he says, he and Holly talked about Iowa’s tough winters, and Holly promised he’d come back in the spring to perform and go water-skiing and swimming. Richardson, who was born a few weeks after his father’s death, first visited the Surf in 1988 and met Maria Elena Holly, Buddy’s widow, and Valens’ siblings. “I never realized my father had the impact he had until I went to the Surf,” he says. He will host some his week’s events. The Surf went through difficult times after the events of 1959. A succession of owners and managers neglected it, and some skipped town, leaving unpaid bills, says Jeff Nicholas, president of the North Iowa Cultural Center and Museum, the nonprofit group that has managed the ballroom since 2008. Over the years, the iconic pineapple murals in the lobby — a symbol of hospitality — were covered by wood paneling and carpet. When it rained, trash cans were arrayed on the dance floor to catch leaking water. In 1994, the Dean Snyder family, owners of a Clear Lake construction company, bought the ballroom and began restorations. The Surf hosted 40 concerts and events in 2011, including shows by 16 nationally known artists, and the annual February commemoration brings about $2 million to the area, says Nicholas, who owns the farm where the plane crashed. “There just seems to be a mystery and a magic” about the Surf and its place in music history, Nicholas says. Billy Gibbons of ZZ Top felt the history of the Surf when his band performed here for the first time in October 2011. This year’s Winter Dance Party begins Wednesday and will feature concerts, dance lessons, memorabilia shows and a bus trip to the memorial site. Pat Boone is the headliner. King and other Surf fans who created a music scholarship fund in 1999 plan fundraising events. to Buddy Holly and marks the entrance to the plane crash site. The Beatles’ name was inspired in part by Holly’s band, the Crickets. Coining the term “music video,” he recorded videos for his songs. By now I'm sure you've heard the news ... Don Cornelius bought his own ticket on the Soul Train to the great beyond yesterday. LOS ANGELES (AP) - Don Cornelius, creator of the long-running TV dance show "Soul Train," shot himself to death Wednesday morning at his Los Angeles home, police said. He was 75. Officers responding to a report of a shooting found Cornelius at his Mulholland Drive home at around 4 a.m., police said. He was pronounced dead of a self-inflicted gunshot wound at 4:56 a.m. at Cedars-Sinai Medical Center, said Los Angeles County Assistant Chief Coroner Ed Winter. "I am shocked and deeply saddened at the sudden passing of my friend, colleague, and business partner Don Cornelius," said Quincy Jones. "Don was a visionary pioneer and a giant in our business. Before MTV there was 'Soul Train,' ... that will be the great legacy of Don Cornelius. His contributions to television, music and our culture as a whole will never be matched. My heart goes out to Don's family and loved ones." "Soul Train" began in 1970 in Chicago on WCIU-TV as a local program and aired nationally from 1971 to 2006. It introduced television audiences to such legendary artists as Aretha Franklin, Marvin Gaye and Barry White and brought the best R&B, soul and later hip-hop acts to TV and had teenagers dance to them. It was one of the first shows to showcase African-Americans prominently, although the dance group was racially mixed. Cornelius was the first host and executive producer. "There was not programming that targeted any particular ethnicity," he said in 2006, then added: "I'm trying to use euphemisms here, trying to avoid saying there was no television for black folks, which they knew was for them." Cornelius, who was inducted into the Broadcasting and Cable Hall of Fame in 1995 and has a star on the Hollywood Walk of Fame, said in 2006 he remained grateful to the musicians who made "Soul Train" the destination for the best and latest in black music. "I figured as long as the music stayed hot and important and good, that there would always be a reason for 'Soul Train,'" Cornelius said. The series spawned a franchise that includes the Soul Train Music Awards, the Soul Train Lady of Soul Awards and the Soul Train Christmas Starfest. Cornelius stepped down as "Soul Train" host in 1993. In his later years, Cornelius had a troubled marriage. In 2009, he was sentenced to three years' probation after pleading no contest to misdemeanor spousal battery. In his divorce case that year, he also mentioned having significant health issues. Soul Train Creator Don Cornelius is dead, an apparent suicide. The creator of Soul Train, Don Cornelius, was found dead this morning at his home in Sherman Oaks, California. According to law enforcement sources the cause of death appears to be suicide. The cause of death was a gunshot wound to the head and officials believe it to be self-inflicted. A complete investigation is underway. Cornelius created Soul Train in 1971 and was the shows host until 1993. He was instrumental with introducing black musicians, like James Brown, Aretha Franklin, and Michael Jackson, to a larger audience and familiarizing the country with R&B, soul, hip hop, funk, jazz, disco, and even gospel music. Don Cornelius, who with the creation of Soul Train helped break down racial barriers and broaden the reach of black culture with funky music, groovy dance steps and cutting edge style, died early Wednesday of an apparent suicide. He was 75. "I am shocked and deeply saddened at the sudden passing of my friend, colleague, and business partner Don Cornelius," said Quincy Jones. "Don was a visionary pioneer and a giant in our business. Before MTV there was Soul Train, that will be the great legacy of Don Cornelius. His contributions to television, music and our culture as a whole will never be matched. My heart goes out to Don's family and loved ones." The Rev. Al Sharpton said he was shocked and grief-stricken. "I have known him since I was 19 years old and James Brown had me speak on Soul Train," Sharpton said in a statement from New York. "He brought soul music and dance to the world in a way that it had never been shown and he was a cultural game changer on a global level." Soul Train began in 1970 in Chicago on WCIU-TV as a local program and aired nationally from 1971 to 2006. It introduced television audiences to such legendary artists as Aretha Franklin, Marvin Gaye and Barry White and brought the best R&B, soul and later hip-hop acts to TV and had teenagers dance to them. It was one of the first shows to showcase African-Americans prominently, although the dance group was racially mixed. Cornelius was the first host and executive producer. Soul Train, with its trademark opening of an animated chugging train, was not, however, an immediate success for Cornelius, an ex-disc jockey with a baritone rumble and cool manner. Only a handful of stations initially were receptive. "When we rolled it out, there were only eight takers," he recalled in a 2006 interview with The Associated Press. "Which was somewhere between a little disappointing and a whole lot disappointing." The reasons he heard? "There was just, 'We don't want it. We pass,'" he said, with race going unmentioned. "No one was blatant enough to say that." Audience reaction and the high-powered talent the show attracted helped it spread. Over the years, Soul Train showcased some of R&B's biggest stars, including Gaye and Brown, as well as crossover white artists. In later years, it featured rap stars, although Cornelius acknowledged that he was no fan of the genre or the racier dance moves that younger teens had embraced. The show's highlight was a dance line. Teens strutted and pranced their way between two lines of dancers awaiting their turn to show off. Over time, the dance line worked its way into American culture and is now an integral part of wedding receptions and parties. Cornelius, who was inducted into the Broadcasting and Cable Hall of Fame in 1995 and has a star on the Hollywood Walk of Fame, said in 2006 he remained grateful to the musicians who made Soul Train the destination for the best and latest in black music. "I figured as long as the music stayed hot and important and good, that there would always be a reason for Soul Train," Cornelius said. Cornelius stepped down as Soul Train host in 1993. The awards returned to the air in 2009 after two-year hiatus. Last year's awards were held on Nov. 27 in Atlanta, with Earth Wind & Fire receiving the "Legend Award." LAPD representatives did not immediately respond to requests for comment. Associated Press writers Nekesa Mumbi Moody in New York and Robert Jablon and Lynn Elber in Los Angeles contributed to this report. For some personal memories of Don Cornelius, be sure to check out Artie Wayne's website posting! I have a few short comments to make on what I read today. First, this being the Year of the Dragon, don't forget Tommy James' DRAGGIN' THE LINE. (I know, I know, that's a stretch). Second, I always liked Norman Greenbaum's followup called CANNED HAM. Finally,Petula Clark's DOWNTOWN was mentioned but I think I just might prefer to go UPTOWN with the Crystals. First, I think the "Draggin' The Line" idea was pretty darn clever! Secondly, I like "Canned Ham", too ... and we've featured it several time on Easter (along with The Jelly Beans' hit "I Wanna Love Him So Bad".) Scroll back through the archives and I'll bet you find these at least twice! Sadly, the Esquire interview proves Berry was right in not allowing interviews. My father, like him, really, seriously needs a hearing aid. Dad still has a few years on Chuck. The story behind this song, 25 years ago. And congratulations are in order for Charlie Gracie, who's back on the charts again with his new single release "Baby Doll"! With his new ABKCO CD "FOR THE LOVE OF CHARLIE" and book of memoirs coming, there's still lots to learn from the unassuming man who ushered in the Philly Sound who is beloved around the world! Well, maybe not commit murder ... but "Baby Doll" IS a "killer" new track from Philly's original rocker. Glad to see he's getting some mileage out of this ... this album's been a long-time coming! Here's a story about one of our favorite guys. least! Excellent musicians, great keyboard sounds and what personality! 96 Tears one of the Greatest Garage band records ever!!!!! song, was always number one with a man by the name of Del Monte.